We made dragons and a picture that has a theme which is rain since it rains today. You can see my artwork on @Playful Post on facebook! I put a lot of my photographs and art there! same. You can use funny scissors. Take another piece of paper, white or just a regular piece and glue all the scraps of the glitter blue paper at the top for a sky. Glue the raindrop on under or on the sky. 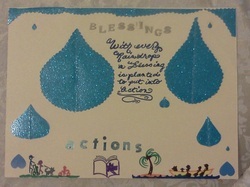 Write, stamp or stick letters to form the word "BLESSINGS" in the sky and "ACTIONS" on the ground. Then get your crayons or markers and draw all of the actions that you liked today. You can draw or create them with bits of paper and googly eyes... or you might want to do the other side if you have a lot to be thankful for! And there you have it... Raindrops Carry Blessings! Crafts, Music, Quotes, even Adopt A Manatee for Father's Day! All for those special fellas in your day! The new June issue is available online, www.playfulpost.weebly.com. To be included in this mailing, please email playfulpost@gmail.com. Filled with Resources: informative ariticles, events, activities and programs, there's something for all ages & interested. Join Playful Post on Facebook & continue receive special invitations and prices! Reinstitute those Summer Habits: Moisturizer or cosmetics with sunblock, hats with a 3-4 inch brim, sunglasses and clothes that offer coverage and spf protection. Try to avoid mid-day sun 10/11am - 3/4pm and keep to the shade. Our favorite Dermatologist recommends using a non-comedogenic (doesn't clog pores) sunscreen with an SPF of 30 or greater year-round for all skin types. Find Swim Lessons to 'Suit' Your Family- Protect against drowning. Largo, FL – Bring your favorite float or chair to Southwest Pool (13120 Vonn Rd, Largo 33774) every Friday night from June 25-July 30 for Largo Recreation's Flick-n-Float Family Movies. From 7:30-11pm, your family and friends will enjoy free hotdogs, Chick-fil-A and prize giveaways, all while watching a popular movie on the big screen. All movies begin at dusk and special discount pricing is available for families of up to 5. Parents - Don't forget to take advantage of Adult Relaxation Hour beforehand from 6-7pm made possible by Massage Envy. Enjoy 60 minutes of blissful relaxation and free massages while your children have fun next door at the Southwest Recreation Complex. Pre-registration is recommended. For more information or a complete listing of movie titles, call (727)518-3126 or visit LargoPools.com. If you have received this email in error, please accept our appologies and reply requesting to be removed from the mailing list. Remember, you may access information for the Florida Keys and the Tampa Bay/St Pete/Clearwater areas anytime, anywhere at www.playfulpost.weebly.com!